Bike and Fashion Match, originally uploaded by [Zakkaliciousness]. Whilst riding about in Copenhagen, please try to match your bike with your clothes, or vice versa, wherever possible. 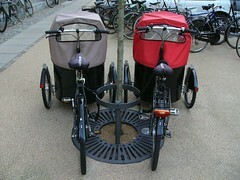 The bike in the photo is one of many Danish cargo bikes brands. In this case, a Christiania bike. Popular around Scandinavia and Northern Europe. Lately I'm often reading on blogs about Bakfiets - the Dutch cargo bike - because they have recently gotten a foothold in America. Indeed, it seems that most of the Americans who write about them seem to think that Bakfiets is the only cargo bike in the world, merely because it's the first cargo bike they've seen and they have no history of cargo bikes. While the Dutch have a long history of bike design - with some cool makes - and are the only real rivals to the Danish bike design tradition, it is only fair to provide a broader perspective regarding the cargo bike market in Europe. This post from Streetsblog has some good photos of Danish cargo bikes in Copenhagen, as does this post of our own. If I had to choose a cargo bike it would have to be the Nihola. Award-winning design, roomy and lightweight. For me, it's the best option for cargo biking in the World's Best Cycling City.